Use GPS, search by address, or tap on the screen to find applicable codes & standards for most U.S. locations.  In the USA, national model codes are often amended and adapted by state, county and/or city. 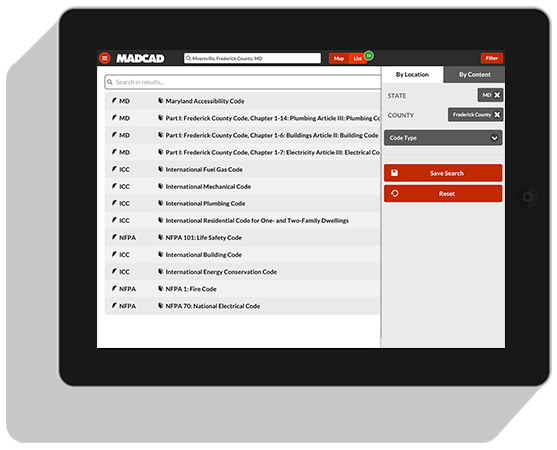 The MADCAD Building Codes app is helping to cut down on confusion by providing a list of applicable codes and standards for the most populated jurisdictions, and we are constantly adding content. If info for your jurisdiction is missing, please send us a link to your content, and with your help we can complete all jurisdictions in the USA. all content in one, interconnected database. Search by state, county or city. Use your current location to find applicable codes for that area.  Touch and hold an area on the map to drop a pin and find applicable codes for that area. 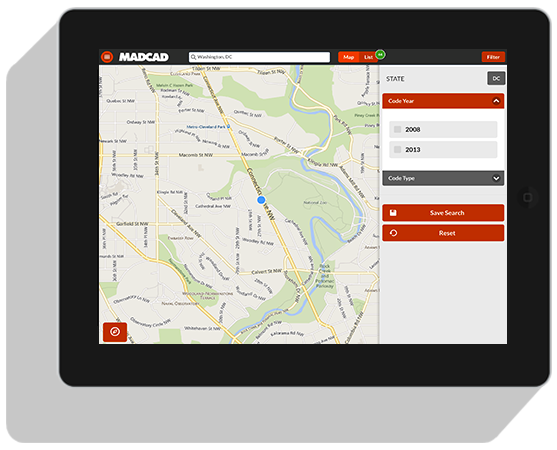 Use the search bar to enter an address, zip code, county or state to find applicable codes for that area. Switch to list mode to view a list of local states and codes. Filter results further by Code Cycle or Code Type. Press the (x) button to remove a filter. Click on a title to link directly to the MADCAD.com Store to add the title to your subscription. See books available from over 10 publishers. 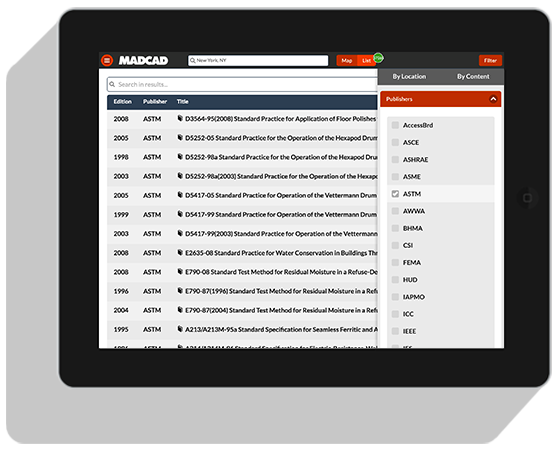 Use MADCAD in the field or the desktop widget to easily find the codes you need. Link to the MADCAD.com Store.  and link directly to the Store to view codes (or purchase). A simple app with great benefits.  from any tablet or smart phone.  Search by publisher to view lists of model codes to buy in the MADCAD.com Store. Link to the MADCAD.com Store to purchase and view all content online. Filter results by Code Cycle or Code Type. 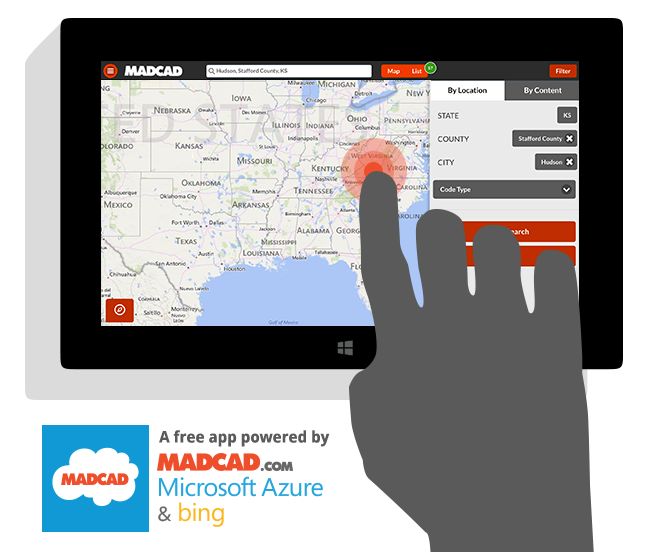 Purchase the MADCAD Building Codes App free of charge. Tap on the map to find local codes and amendments applicable to that area. Find out applicable codes from an easy to use app you can take on the go. App updates to give you easy access to even more information. We currently have data for over 2,500 jurisdictions. And our list is constantly growing. Due to this vast amount of data, we encourage you to double check information with your local jurisdiction. If you find any information to be incorrect, or if data from your jurisdiction is missing, please send us your feedback here so that we may immediately fix the issue.